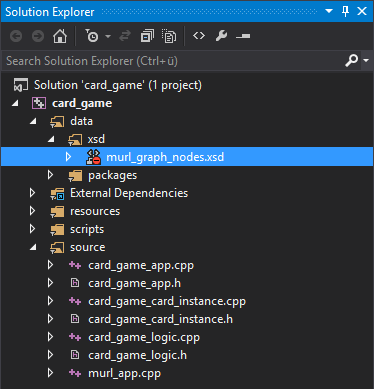 Creating Murl Engine scene graph XML files can be a long-winded task, especially for beginners who are new to the syntax. To facilitate the creation of XML files, we now provide a complete XML Schema that contains the description of all possible XML tags and attributes. In combination with a proper IDE you gain all the "Intellisense" code/content assist goodies like automatic code completion, context sensitive selection lists, hints, code validation and error highlighting. The XSD file will be provided as part of the Murl Engine with all future releases. The file will then be located in the directory murl/common/xsd/. In the meantime you can also download the file from here. If your IDE provides an XML editor with XSD support you greatly benefit from automatic code completion and live validation. Let’s illustrate the advantages with a short example using Visual Studio. We create an XML animation resource file and start a new tag with the < character. The editor automatically displays a list with all possible tags that are allowed in an XML animation resource file. If we select one element in the list, we get additional information about that tag displayed to the right. We select the desired tag and immediately get a list with all possible attributes for this tag; again with hints in an extra overlay window to the right. The wavy line under the PositionKey tag reminds us that we haven't specified all mandatory attributes yet. We select the desired attribute. If the possible attribute values are composed of a fixed set of values, like an enumeration, the desired value can again conveniently be selected from a list. For other values we get a brief syntax check. For example, in the screenshot below we set the angle to 90 degrees but forgot to specify the deg/d suffix. Visual Studio is reminding us that the value is not valid according to the XSD and therefore draws a wavy line below that value. When we add the suffix d, we get a document that passes the XSD validation and the wavy line disappears. Tell the editor where your XSD file is stored. Link the correct XSD file with your XML file. Step two is generally done by specifying the correct namespace in the root tag using the attribute xmlns. The simplest way in Visual Studio is to add the XSD file to your solution and exclude it from build (Properties > Exclude from Build). Now you have full XML content assist functionality in Visual Studio. Note: Future versions of the Dashboard will automatically add a reference to the XSD file when a new project is created. Go to Window > Preferences > XML > XML Catalog, and click Add. Now you should have full XML content assist functionality in Eclipse. Note: Press CTRL-SPACE if the overlay does not show up automatically. Now the XML content assist functionality should also be available in Intellij IDEA. For other IDEs and XML editors the method is similar. Note: Xcode has only poor editing support for XML files and does not support XSD validation. You may have to use Eclipse or another XML editor to get XSD based content assist functionality on a Mac.